Scottish athletes "can be the best in the world", says the national governing body's new director of performance and coaching. Stephen Maguire says Scottish Athletics now "expect" rather than "hope" their competitors will be successful. The Northern Irishman, formerly head of power at British Athletics, replaces Rodger Harkins in his new role. "Rather than turning up and getting the T-shirt now, it's turning up and getting to the podium," Maguire said. "Part of my job is instilling that belief that Scottish athletes can really take on the best in the world." 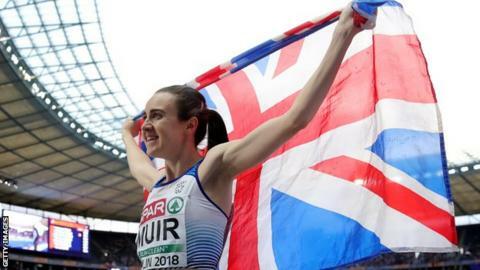 Mark Munro, chief executive of Scottish Athletics, says the sport "at performance level is probably in as good a state as it's ever been" and hailed Maguire - whose British relay squads won four World Championship medals last year - as a "world-class" addition. Team Scotland returned from this year's Gold Coast Commonwealth Games with five athletics medals, their highest total since Auckland in 1990. Laura Muir, meanwhile, added to her major medal tally with 1500m gold at the European Championships, following a silver and bronze at the World Indoor Championships. Eilish McColgan took European 5,000m silver in Berlin while Jake Wightman took 1500m bronze to continue a recent run of middle-distance success. Maguire is confident Scotland can also produce high-quality sprinters if coaches are "smart in our decision-making". "There are role models now, people can look up to athletes, coaches can look up to other coaches and they can actually see that it can be done, that Scottish athletes can be the best in the world," he added. "It's something we expect to happen rather than hope is happening. "To try and develop a sprinter in December or January in Scotland, outdoors, is going to be very, very difficult. "But we've got indoor facilities and we can be very adaptive in the training. The Canary Islands are only a couple of hours away on a flight as well, so there are ways to do things, but absolutely we can do it in Scotland."